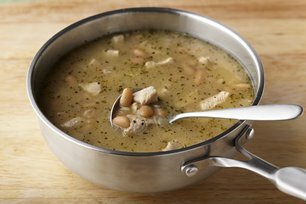 Chunky with cubed chicken breasts and white kidney beans, this chicken soup is as quick and easy as it is hearty. That's thanks to canned beans and broth. Heat dressing in large saucepan on medium-high heat. Add chicken and onions; cook and stir 8 min. or until chicken is done. Stir in flour. Add beans and broth; mix well. Bring to boil; cover. Simmer on medium-low heat 20 min., stirring occasionally. White kidney beans are also known as cannellini beans. Looking to cut back on sodium? Try this recipe with no salt added beans.